Throughout my adult life I have met many people. Some are doers and some are not. Nevertheless, they all live together side by side and life goes on. Just as well, because if everyone was a doer, we would probably all end up getting in each other’s way. In this article I am going to be a bit personal if I may and mention five people who I have associated with in my life, and who I feel are quite extraordinary, and have done things far in excess than the normal, and at the same time doing these things without shouting from the rooftops. I am mentioning them because I feel they deserve a pat on the back for their efforts. This is not to say that there are not many more such people around equally as commendable, but lack of room prevents me from including more in this article. Just over a year ago, I wanted to recreate a full-size replica of the galleon San Giovanni, which was one of the great warships of the Knights of Malta. This was to be placed on a platform just under Fort St Angelo facing the entrance to Grand Harbour, and was to be used as a touristic attraction, with thousands of visitors experiencing the unique atmosphere of times long past. This would have been something along the lines of The Cutty Sark in London. It would not have been a commercial business as all profits would have gone only to Maltese charitable causes. The galleon would not have been seaworthy, but it would also be used to get young people to work together as a team, putting up sails, and generally maintaining the project. The Prime Minister, The Tourism Minister and the Minister of Culture were all in favour but then we went to other high-ranking officials, whose help we would have needed to get the necessary help and permits, but here we received a mixed and lukewarm response. At this point I decided rightly or wrongly that what lay ahead was a minefield of problems in order to get the project completed and active. I discussed the situation with the person, who was working with me on the project, Ino Bonello, and we decided to back off. A shame really because it was all for the good of Malta and those Maltese people who needed our help. Bonello is very involved with the special effects of the Malta Film Facilities and I asked him whether we could build this wonderful ship. He said yes of course, as if I was asking him to make me a plate of pasta. I said to him, after I looked at him again to make sure he wasn’t pulling my leg, okay, let’s do it. When we decided to stop the project, I did not hear from him for a few months. He phoned me up, and asked me to go to the water tanks at Rinella, as he wanted to show me something. When I got there I saw not one but two beautiful wooden galleons that were being made for an Indian film. They were beautiful, both outside and inside. He looked at me and said: you see I told you we could build a ship, in fact we built two. By we, of course, he meant the carpenters and workmen of the Malta Film Facilities. What a credit they are to our country. And to Bonello, a quiet unassuming man, who gets things done. At present, I am sitting on the board of the Malta International Airport Foundation. This foundation finances projects in Malta that are linked with our culture and heritage. At the moment the foundation is funding the complete renovation of The War Rooms and ancillary rooms and equipment, and the Operation Husky preparation rooms and museum situated under the Upper Barrakka Gardens and the Malta Stock Exchange. The foundation is supporting, among others, Fondazzjoni Wirt Artna, which is run by an extraordinary man, Mario Farrugia. What he and his team are doing is amazing and well worth a visit. He is everywhere, and supervises and organises everything. Not only at the War Rooms but on 27 other sites throughout Malta and Gozo. He is a human dynamo. I have nothing but praise for the man. Have you heard of him before? Not many have, but we can all see his work, left to us for posterity. I must thank him. Tucked away, near the national football stadium, is an old Nissan hut that used to belong to the British Forces. It is very long and full of aeroplanes and aeroplane parts and World War II memorabilia. This was the original Malta Aviation Museum. It is run by Ray Polidano, his wife and his son, as well as a great team of volunteers. The museum has now grown bigger and has two new large hangers where aeroplanes are on display and others are being restored. 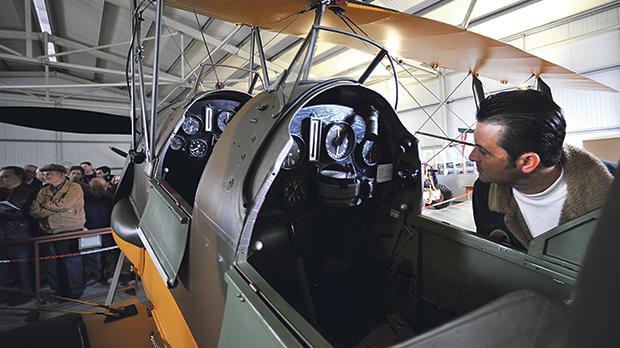 Planes such as the Spitfire, the Hurricane and the Tiger Moth. All are on display in their nostalgic glory. This museum was started, and is still run today by volunteers, who do all the work in their free time. What they have achieved with little or no resources is quite amazing. Without these type of people, who really believe in what they do, and what they can leave to posterity, we would have much less to show our children. Polidano has done a great job. He is a quiet and humble man, who takes every challenge in his stride, and with his team achieves miracles. Peter Calamatta is a good friend of mine. He and his family are experts on all matters concerning horticulture. A few years ago, he and a group of like-minded businessmen arranged with the authorities that they would look after roundabouts, centre strips of roads and common areas bordering road networks. What an amazing job they have done, and thank goodness that they have done it. They have transformed our road networks and our environment. They have given us greenery and colour. They have given us neatness and order in areas where you normally see none. Everything they touch embellishes our country. Calamatta has accomplished beauty and smartness comparable to other developed countries and has made us very proud, and doing all this when not in the very best of health. He, in my opinion, is a major player in our country, as well as being so humble and unassuming. Last of my extraordinary people, is probably the most controversial. Controversial as such, because he is an architect, and a very good one. Ray Demicoli is an amazing person, quiet and reserved, but explosive in his designs and creations. Portomaso, was started with him and other colleagues but the courage of undertaking and designing a project that has become a standard bearer for all quality developments in Malta is extraordinary indeed. The award-winning Hilton Hotel. The first tower block in Malta. The yacht marina. The Laguna marina. The landscaping, greenery and strict maintenance have been a first for Malta. Demicoli has followed this development by others of the highest quality and integrity, and will be followed by many more, I am sure Malta will be proud of. When you speak to him, he is so soft spoken, that you wouldn’t immediately think of him as a high-flier, but appearances can be so deceptive. His feet are solidly on the ground and his love for Malta and his love for doing things right as so evident. Five very special people. Five people, that we Maltese should be proud of. We are so lucky to have them. I have only highlighted five. Malta is full of such people and they all deserve credit for what they do.